A web site requires some computer space to be stored.. The space needs to be on a server connected to the Internet, ideally in a proper and secure data centre. Truska use a secure tier one data centre located in Belfast. All servers have UPSs (uninterrupted power supplies), are backed up daily and have sufficient resources and bandwidth to meet the demands of the installed web sites. Our servers have an up time of 99.9% and offer a secure and managed resource for your web site. Our servers are hosted in a local datacentre that meets demanding standards and is certified to ISO/IEC 27001:2013. All our servers now live on a redundant clustered infrastructure where all changes are mirrored in real-time to another physical piece of hardware. Backups are made every 24 hours and remain off site and on a 28 day rolling basis. 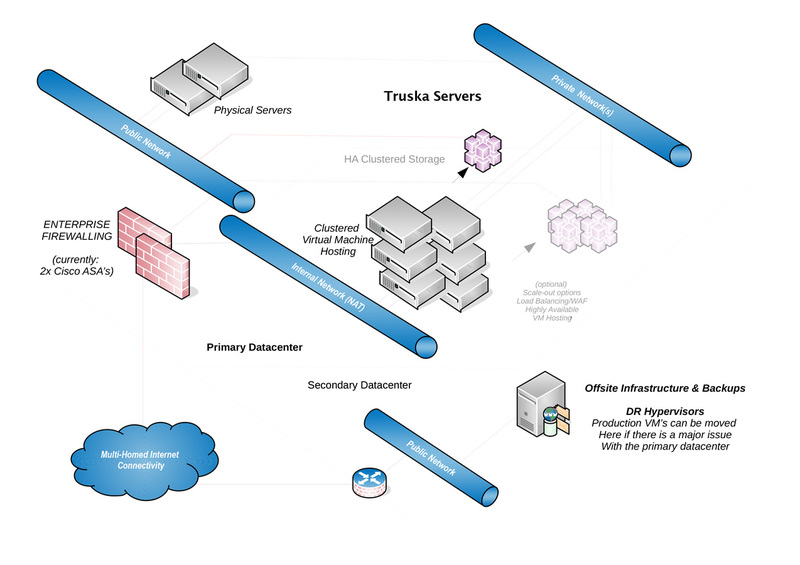 Diagram on the right shows the hosting structure deployed by Truska which offers significant levels of security, protection and data continuity. "delivering a well structured, easy to use and informative web sites within budget"